Bathrooms: 10 "4 more bathrooms at lobby"
Excelente Locación Comercial en la famosa Quinta avenida de Playa del Carmen, con 12.5 metros frente a la 5ta. entre calle 6 y 8 NTE. con superficie de 670 m2. El Hermoso y Exitoso Hotel "LUNATA" estilo Hacienda Colonial Mexicana con 10 exclusivas habitaciones cada una diferente. Area de Lobby, recepción oficina y jardín con palapa. Local Comercial al frente a la 5ta con 124 m2 de superficie con ingreso mensual muy atractivo. El Lote tiene libres 472 m2 para construir mas habitaciones o darle uso comercial. 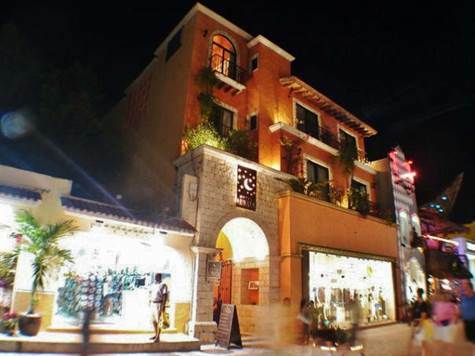 Beautiful and successful Hotel "LUNATA" with a commercial space at the front of the famous 5th avenue of Playa del Carmen. Between 6th and 8th St.
HOTEL DESCRIPTION Hotel Lunata is a charming hacienda-style hotel located on Fifth Avenue, the heart and soul of Playa Del Carmen, just steps away from the Mexican Caribbean’s pristine white sand beaches. Centrally located, Hotel Lunata is easy walking distance from everything Playa del Carmen has to offer, including beaches, international restaurants, upscale boutiques, unique artisan shops, Mayan ruins, and bars with live music that ranges from mariachis to reggae. Each of Hotel Lunata's ten spacious rooms was designed to please the eye and comfort the soul. The design recalls the traditional charm of Mexico's haciendas, yet offers total modern day comforts. Every room is named after a different moon in our solar system and has a private balcony with a view of the ocean, garden or 5th Avenue. Hotel Lunata's accommodations include all the amenities you expect, but rarely find in Playa del Carmen. For your year round comfort, the rooms are centrally air conditioned, have flat screen TV with international channels & Wi-Fi. The rooms at hotel Lunata are all unique, but there are Three Types: Junior Suite, Standard Queen, De Luxe King, featuring two double beds, one queen size bed or one king size bed respectively. Has a Kitchen, Palapa for dining or special events, and a 1,300 sq. ft. Commercial retail Space at front on 5th ave rented to a very famous boutique with a very good monthly income. The Lot where Hotel Lunata is located have another 4,800 sq feet where you can build more to grow the number of hotel rooms. The permits are ready, or you can give another use and build commercial spaces too.